Many people have heard of the Silk Road, the extensive route that facilitated the silk industry for centuries, and allowed trade to grow between Asia, the Middle East and Europe. For this blog, we decided to give our #EthicalSilkCo followers a little more detail on just how significant the Silk Road was (and still is) in shaping the world we know today. The Silk Road itself is just under 6,500kms long and expands across much of Asia, the Middle East, into Europe and finally Africa. It became a popularized route when the Persians, followed by the Italians, joined in the sericulture industry to manufacture the much sought after material: Silk. By the 13th century the Silk Road, or Silk route as it was also commonly known as, had been widely acknowledged and fully established. Despite the route not being officially established until the 2nd century BC, ancient remains found in Egypt reveal that Silk was traveling along its various tributary routes long before previously thought, even as far back as 1070 BC. Research maintains that some Egyptian mummies, presumably royalty, were buried with silk along with other valuable or essential items which they would need when passing into the afterlife. 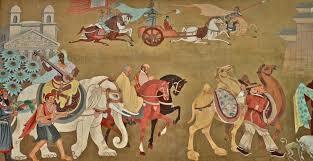 However, it wasn’t just concrete goods that were traded along the Silk Road. Cultural and religious exchanges began to drift along the route, acting as a connection for a global network where East and West ideologies met. This led to the spread of many beliefs, cultures and even religions. For example the route aided the spread of Islam, with many Arab Muslims traveling along the Silk Road to China in order to spread the Islamic faith. Additionally Buddhism, Zoroastrianism, Manichaeism and Nestorianism were all introduced to China and parts of India because of the Silk Roads’ impact. Knowledge of papermaking also grew through the route. This production method spread from China through much of Central Asia as a direct result of the route itself. 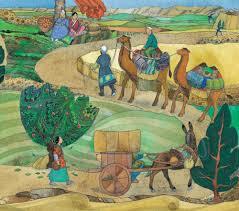 Architecture, town planning, as well as music and art from many different cultures were transported along The Silk Road. Actors from the East performed in Constantinople (modern day Istanbul). Music from Eastern Turkestan and Central Asia grew popular in China, while buildings such as Timur's structures in Samarkand and Timurids tombs at Gur-Emir, have heavy architectural influences from various countries such as Iran, Georgia and India.